In view of the trial that began on January 17 and for a better dissemination of the ideas of the Conspiracy of Cells of Fire, a book is being published in Spanish, first in digital pdf format. The book is called “Reventando lo existente. 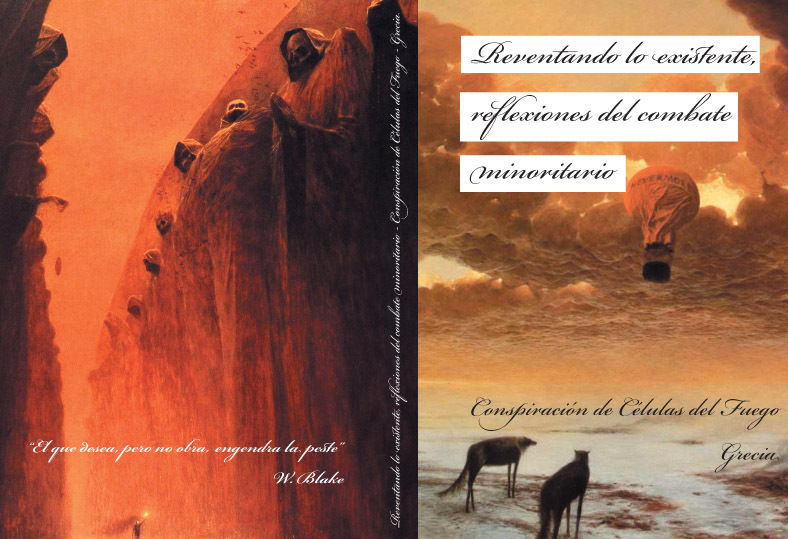 Reflexiones del combate minoritario” (Destroying the existent. Reflections on minority struggle) and contains a chronology of the Halandri case, all the statements of the prisoners (Massoura, Hadtzimihelaki, Karakatsani, Tsakalou, Argirou), the chapter “Critique and contributions” (The statement “The interpretations they give, time to talk about their aspirations,” chapters 3 and 4 of the brochure “Conspiracy Theories”, the text of G. Voutsis Vogiatzis, pages from “The Diary of a Bomber” and the letter that Poly Georgiadis wrote to the Conspiracy of Cells of Fire) and a few communiques and texts of the Conspiracy.